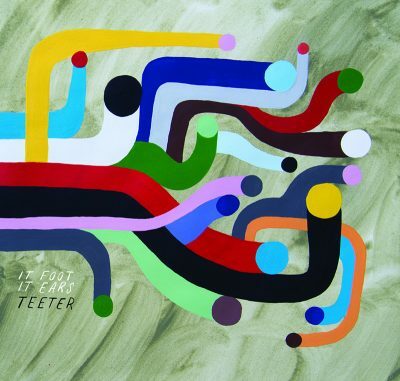 teeter, the third release from experimental duo it foot, it ears, opens with guitarist Jason Rabb screaming, “What’s the key to comedy?” while drummer Nick Foster simultaneously responds (in a conflicting meter), “Timing! Timing!” It’s an overwhelming, disorienting and hilarious moment that serves as a proper introduction to the rest of teeter. Across the nine short, densely packed tracks, it foot, it ears prove their unmatched accomplishments in technical ability, compositional intricacy and, above all, personality and wit. The primary formula on teeter is the exploitation of stark juxtapositions. Rabb’s vocals frantically move between sharp yelps and hushed, whispery singing, shifts that are always followed precisely by the instrumentals. The guitar is as often reservedly plucked as it is overblown, scraped, smashed and abused, while Foster’s percussion is unconventional with heavy, straight rock beats to either compete with Rabb’s freewheeling mania or provide a sturdy base for a track. Sometimes these changes happen so quickly that the tracks feel like a dead sprint through song ideas, as if the duo is trying to race their own clock. It’s the unique timbres and experiments with instruments that keep the guitar-percussion format from limiting teeter’s diversity. “jump rope” is plunky, slow and full of tense silences, while the lumbering blues in “shake on it” give way into the arrhythmic punk freakout of “racket.” Most of the credit due to this simple technicality is the physical manipulation of their instruments. On “lost an ear,” Foster tightens and loosens his drum heads to follow the rising and falling melodies on Rabb’s guitar so delicately that the music sounds as if it’s literally bloating and deflating in the mix. Moments like these separate it foot, it ears from other experimental rock groups who simply display technical flash. Rabb and Foster understand the vivacity of sound.